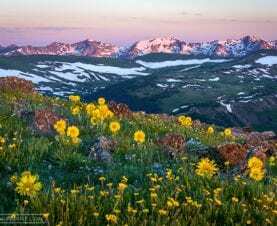 How can I avoid the summer crowds in Rocky Mountain National Park? Visit the park during the week, not the weekends… The top 10 busiest days in order from top-most visited to tenth-most visited were : September 24, July 3, September 4, September 17, July 24, July 10, July 17, September 5, July 23 and July 30, all of which fell either on a weekend or a holiday! Weekends from late June through September are the most crowded. Get to the park early (before 10 am) … the park staff this past summer and fall limited the access to both the Bear Lake Road corridor and the Wild Basin area when the parking areas were filled and there was a possibility of heavy congestion in those areas. Ride the bus … it’s easier to park in downtown Estes, then take the free shuttle into the park. Visit the park during the off-peak season when you can get good deals on lodging … January through mid-May and October through December. Why can't I find Estes Park lodging for just one night in summer? Be flexible. If you don’t have to go on specific dates, a lodge can often find openings around your desired dates. Call and offer to “fill the gaps”. Online reservations may not be able to accommodate this, but a front desk manager can. Be willing to change rooms in the middle of your stay. Indicate your willingness to change and ask the lodge if they can put together two openings to form a block for you. Book a 1-2 night midweek stay. If weekends are full, Mondays and Tuesdays often have openings. Go to https://www.estes-park.com/lodging-availability-request and submit a Lodging Availability Request Form. This notifies all the lodges of what you’re looking for, and you’ll get return emails from any that have openings that match your parameters. If you can’t find lodging for your entire stay and you’re flying into Denver, consider staying the first and/or last night in a motel near the airport. It’s a 90 minute drive to Estes Park. Take an overnight trip in the middle of your stay to explore the west side of RMNP and stay in Grand Lake for one night. This will allow you to put together two non-consecutive blocks. Call some of the larger properties. More rooms to fill mean more opportunities for last minute openings. Consider Front Range hotels in Fort Collins or Loveland that are about an hour drive away from Estes Park. How can I get a campground reservation in Rocky Mountain National Park? Get Ready, Camp in Rocky Mountain National Park. This blog post explains it all! Can I take my dog hiking with me in Rocky Mountain National Park? No, dogs are not allowed on any trails in the National Parks, and most lodges won’t let you leave your dog unattended in your room. See our Bring Your Dog? page for suggestions on what you’ll need to know about vacationing in Estes Park with your favorite pet. Don’t despair – there are some good alternatives for a vacation with your “best friend”. Are there any fees charged in Rocky Mountain National Park? 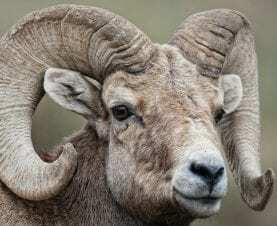 An entrance fee is charged to get into Rocky Mountain National Park. Currently there is a $35 per vehicle entrance fee which is good for 7 days. The Annual Park Pass is currently $70, so if you’re coming more than once, it pays for itself. The park has a “Day Use Pass” valid for one day only and costs $25. Also, if you walk in or take the Shuttle Bus, a fee of $20 per person is charged, good for 7 days. Campground charges begin at $26 per campsite per night. During the busy summer months, advance reservations for campsites are highly recommended, and you will be asked to pay in full at the time you reserve your site. A backcountry permit processing fee of $30 is charged to camp in the backcountry. 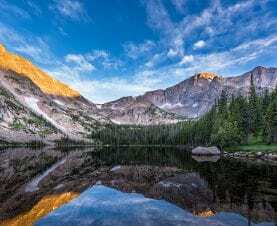 Are there any entrance fee free days in Rocky Mountain National Park? Yes, in April (National Park Week), June (Get Outdoors Day), September (Public Lands Day), November (Veteran’s Day Weekend) no entrance fees will be charged. Other fees for camping, reservations, concessions, etc. are still in effect. Are there any Senior Discounts for the National Park? Probably the best deal around is the Senior Pass National Parks and Federal Recreational Lands Pass. It costs $80, but is a lifetime pass for US citizens or permanent residents age 62 or over. An annual Senior Pass costs $20. The Senior Pass covers entrance fees for the pass holder and passengers in a non-commercial vehicle, and a 50% discount on some fees like camping, boat launch, swimming. You must get your pass in person at the Park. We want to climb Longs Peak. What do we need to know? The Keyhole Route, Longs Peak’s classic mountaineering route, is open for hiking for only a short time most summers. In an average year, park rangers consider the route non-technical July 14 to September 15 when free from ice and snow. You’ll cross enormous vertical rock races and encounter narrow ledges, loose rock, and steep cliffs, and will need to scramble on all fours. This challenging route requires stamina because it has an elevation gain of 4,850 feet, and is eight miles one way. Time for the round trip averages 10-15 hours. It was the choice of celebrated British adventurer Isabella Bird in 1873. At 14,259 feet, Longs Peak towers above all other summits in Rocky Mountain National Park. It’s a big mountain experience that shouldn’t be underestimated – safety and preparation are essential. Acclimate to the altitude before starting out. In the summertime – the season when thousands hike or climb to Longs’ summit – early mornings are calm, clear and blue. Clouds build in the afternoon sky, often exploding in storms of brief, heavy rain, thunder and dangerous lightning. Begin the trek early, by 3 am to be off the summit by 10am and back in the car before the weather turns. Check with a ranger for current conditions. 970-586-1206. Obtain a reliable weather forecast for elevations ranging from 8,000 to 14,000 feet. Do elk lose their antlers every year? Yes, the antlers of nearly all deer species (US deer include: mule deer, white-tailed deer, elk, moose, caribou) on the planet fall off every year and then grow again. Mid-March is when bull elk cast off their antlers and within days of dropping, their new antlers start to grow. Once those antlers hit the ground, they play an interesting role in the ecosystem. Antlers are vital for small mammals as sources of calcium, potassium, and protein – which explains why you are not allowed to take them home with you as a souvenier of your visit to RMNP! Around mid to late winter elk antlers fall off naturally and start regrowing for the elk’s next Fall Rut display. Sometime in March to April is prime time for finding one of these trophy prizes! Tips for locating elk antlers: watch the big bull elks from afar, and use a spotting scope to scan a large area. If you keep your distance, you can prevent undue stress to these animals who have struggled to survive winter. If you do find an antler, keep looking for it’s match – they often are found near each other. And always leave antlers where you find them inside Rocky Mountain National Park for other visitors to admire. Outside the Park, “Shed” collecting is a popular past time in the Colorado Rocky Mountains. Can you really go carless on a vacation to Estes Park? Yes, definitely, and there are lots of advantages. If you’re flying into Colorado, there is shuttle service from DIA. Once in town, Estes Park has convenient free shuttle bus service around town to lodging, shopping, activities, and dining. Rocky Mountain National Park provides shuttles into the Park to visitor centers and popular trailheads. See our Shuttle Bus page for more information on routes and times. Any ideas for a romantic weekend getaway? Pick a cozy mountain cabin with a wood-burning fireplace, or an elegant riverside suite with a hot tub on the deck. 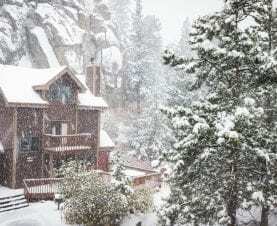 Lodges in Estes Park specialize in romantic getaways, and many lodges provide special packages, especially popular in winter. In-suite private jacuzzi spas are great if you don’t want to brave the cold outside. There’s romantic fine dining with live music at several restaurants in town, and just the chance to get away and be together is “priceless”. Riverspointe Spa on the Riverwalk specializes in couples massages.